Near the Vatican in October 2001, Janice Sevre-Duszynska and fellow advocates hung a banner calling in seven different languages for the ordination of women. Almost seven years later, the fruit of that action and many others like it was realized. Janice’s long-awaited and hard-fought ordination Mass took place Aug. 9, 2008, in Lexington, Kentucky. Roman Catholic Womenpriests are honored to participate in the “Shadow Synod” which will be held in Rome in October, 2008 at the same time as the Vatican Synod of Bishops on the Bible. Ree Hudson, a Roman Catholic Womanpriest from St. Louis will represent the Roman Catholic Womenpriests USA. Although a few women have been invited to participate as experts, decision-making at this Synod will once again be limited to male clerics. In contrast, Roman Catholic Womenpriests are offering the church a renewed model of priestly ministry rooted in the New Testament.Jesus offered an example of Gospel equality that led to the practice of ordaining women as deacons, priests and bishops in the early church. Jesus treated women and men as equals and partners. Jesus chose the Samaritan woman to announce the good news to her entire village, and the Samaritans accepted Jesus as Messiah because of her testimony. Mary of Magdala, the first witness to the resurrection, was commissioned by Jesus to be the apostle to the apostles (John 20:1-18). In 1976, the Pontifical Biblical Commission echoed the sentiments of Jesus in concluding there is no biblical reason to prohibit women's ordination. Women and men are created in God's image and both may represent Christ as priests. "In the image of God, God created humankind, male and female God created them" (Genesis 1:26-27). In 1976, the Pontifical Biblical Commission on women priests concluded after a two year study of scripture that by a vote of 12-5 that neither the bible nor Christ excluded the ordination of women. The vote in favor of ordaining women was 14-3. Although the Roman Catholic leadership has been all-male for the past 900 years, Christianity's first millennium saw numerous women serving with distinction as deacons, priests and bishops. Roman Catholic Womenpriests are reclaiming our ancient heritage.and shaping a more inclusive, Christ-centered church of equals in the twenty-first century. Womenbishops ordained in full apostolic succession continue to carry on the work of ordaining others in the Roman Catholic Church. We are living a new model of priestly ministry united with the people with whom we serve. Ordained women are serving the people of God in many ways including house churches and parish communities, celebrations of weddings and baptisms, hospital and hospice chaplaincy, prison ministry, anointing of the sick and elderly, ministering with homeless people, peace and justice witness and spiritual direction. Our movement is receiving enthusiastic responses on the local, national and international level. Following Fr. 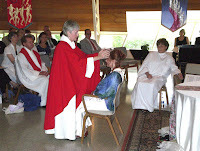 Roy Bourgeois participation in the ordination of a Roman Catholic Womanpriest in Lexington Kentucky on Aug. 9, 2008, the Maryknoll Community has called for a worldwide dialogue on the issue of justice for women in the church, including the ordination of womenpriests. Roman Catholic Womenpriests stand in solidarity with our biblical sisters and offer the gift of a renewed priestly ministry that reflects the feminine face of God. Turns out that at the same time there has been a roiling cyberdiscussion over the import of the "women's ordination" ceremony staged in Boston by Roman Catholic Womenpriests, there is also a renewed debate over women's ordination going on in academia as well.